After Godzilla, it was time for supper. We decided this would be as a group. Those who went to the movie would find a place nearby and go for dinner, thereby extending the camaraderie. But, a number of other guild members, who didn't want to see the movie, also wanted to participate in the dinner. Where to go which would accommodate a bunch of people, some of whom had never met, in a relaxed setting without us being too much of an imposition? 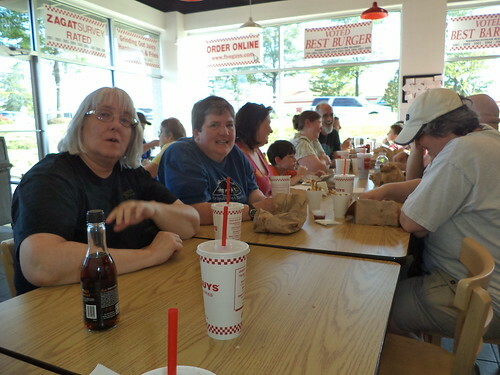 There are a lot of eating places around the theatre and the group decided on Five Guys. 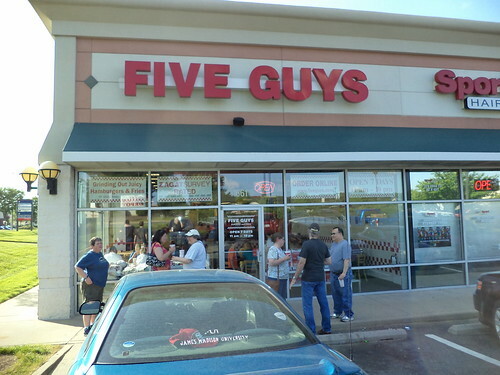 I've never been to Five Guys. It's only recently made it into the Chicagoland area. I really knew nothing about the chain, but other people said it would be the perfect place to rendezvous after the movie. It was perfect. Ollivor and Jorlynn and Zylostout and Wendrah joined us so we shoved four tables together and had a blast. 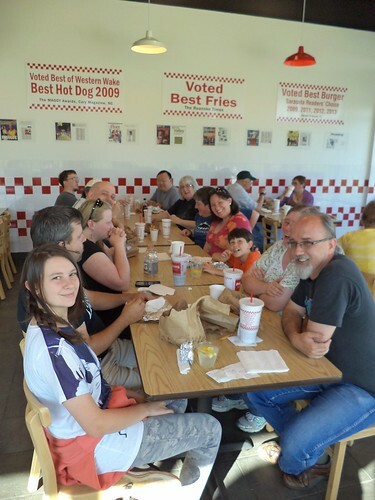 The place was billed as the burger equivalent of Culver's, an upper Midwest chain. I guess that would be an apt description. You place your order under the "Order Here" sign and then wait for your number to be called. Nothing is made ahead of time. It's all fresh. You get a huge bag of fries with your order and I was told to order the small side of fries. It was still pushing it to finish. I found the burgers just average. I've had better burgers in other locations, usually at small spots who are not part of a chain. The fries were good, but nothing I'd bend time and space to have if I craved fries. The service was a bit slow. I'm not sure if it was because we descended upon them in a mass and they weren't quite prepared for all of us all at once, or they were understaffed, but we had to wait a good 15 minutes for food. In the pseudo-fast food area, where Five Guys is positioned, this is a long time. I had to wonder how they handle the Tuesday lunch crowd because I would cease coming to a fast food place that took that long to prepare my food. And that does bring up one of my "favorite" pet peeves. These people, working on a Saturday early evening to prepare food for people on vacation who have Saturday off and had just watched a movie, are considered "unsuccessful", because they are cooks at a burger joint. I applaud them for choosing to work here so I could try the food. I did learn a new skill at dinner. Perhaps you have seen these new beverage dispensers at Wendy's. They always frustrate me. How the heck do they work? 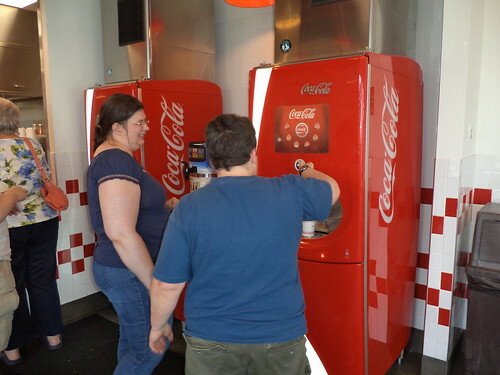 Wendy's advertises that these dispensers will give you well over 100 different choices of soft drink. I just want a Dr Pepper. Is that possible? My daughter, who is way smarter than me, shows Wendrah how to operate the machine. After watching, I could get a Dr Pepper mixed with Coke or Root Beer or Sprite or orange or all of that. Now, I'm not intimidated by this machine when I go into Wendy's, which is the only place I've seen them. Funny thing, I haven't been in a Wendy's since April. It was a great experience to be with guild members, sharing food and friendship. I'm glad I had the chance to eat at Five Guys. It's not bad, I would eat there again, but it's not a place I'll go out of my way to find. Perhaps, if I gave other menu items a chance, instead of just eating a burger, I might find something I like much better. Hope you have been enjoying the Summer and staying cool.